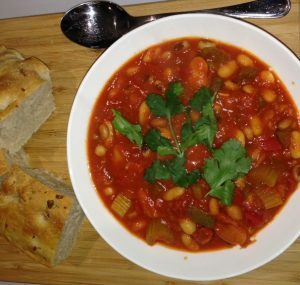 A lovely vegetarian dish this robust bean casserole is full of flavour and is very easy to make with Jethro’s Red Chilli & Garlic Sauce. Warming and hearty it is packed with lots of vegetables and pulses for slow-release energy. Serve on its own, or with brown rice or lovely just mopped up with freshly baked focaccia bread. Heat the oil in a large saucepan and add the peppers, onion and celery. Season with salt and pepper. Stir. Cook for about 5 minutes. Add the chopped tomatoes, tomatoe puree and water. Stir. Simmer for about 20 minutes stirring frequently. Add the canned beans and 3 tbsp Jethro’s Red Chilli & Garlic Sauce. Stir, and simmer for a further 10-15 minutes. Serve withthe fresh coriander sprinkled over the top.